Dhoni became the 1st Indian to register 400 ODI scalps after dismissingAiden Markram in the 3rd South Africa vs India ODI in Cape Town. Virat Kohli and Indian spinners Yuzvendra Chahal and Kuldeep Yadav inflicted yet another embarrassing loss on South Africa. India was spectacular in the third ODI at the Newlands in Cape Town as M.S. Dhoni creates history. Dhoni became the first Indian and fourth overall, in the list of wicketkeepers, to scalp 400 ODI dismissals. Batting first, India piled on 303 runs for the loss of 6 wickets as Kohli led from the front with an unbeaten 160 runs, his 34th ODI ton and 55th international century. After setting up a huge target of 304 runs, Chahal and Kuldeep then wrecked havoc as the wrist-spinners shared eight wickets among them to bowl out the Proteas for 179 runs. While Kohli bagged Man of the Match award, India wicketkeeper and former captain M.S. Dhoni created a record during South Africa innings. 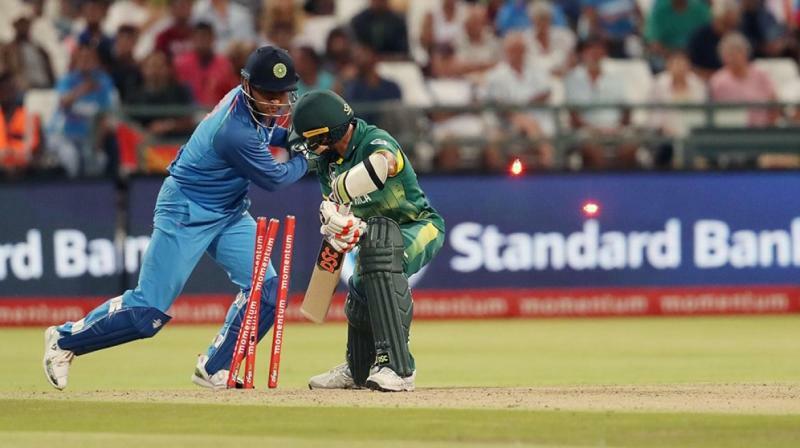 Dhoni stumped South Africa stand-in skipper Aiden Markram off Kuldeep Yadav to claim his 400th victim in ODI cricket. The feat was achieved in the 17th over of the South African innings. Kuldeep deceived Markram with a tossed-up delivery and Dhoni removed the bails in a flash to send the Proteas captain back to pavilion. Dhoni became the first Indian keeper to have 400 dismissals in ODIs. He is currently fourth on the list behind some legendary names in the game like Sri Lanka’s Kumar Sangakkara, Australia’s Adam Gilchrist. And of course, South Africa’s Mark Boucher. Sangakkara tops this list had 482 dismissals from 404 matches. Meanwhile, Gilchrist and Boucher have their gloves in 472 and 424 dismissals respectively. Dhoni took just 315 matches to achieve the feat. He also leads the list of wicketkeepers having more stumping in the ODI format with 106 stumpings to his name so far.